Dr. Charles Young is the Superintendent of Schools for Benicia Unified School District. Dr. Young has been Superintendent of Schools since taking the position in July of 2015. Dr. Young came to us from serving as the Associate Superintendent of Educational Services for the Palo Alto Unified School District. Dr. Young started his educational career as a high school English teacher then moved into site administration where he served as a vice principal and principal for both elementary and middle school levels. He then transitioned to the district office level where he served as a director of secondary education before going to Palo Alto. 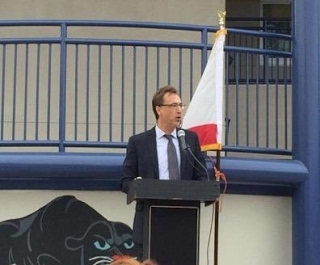 He earned his doctoral degree from the University of La Verne in 2004, is a contributing member of TICAL (Technology Information Center for Administrator’s Leadership), and a facilitator for the Association of California School Administrator’s (ACSA) Leading Edge Certification technology course. Dr. Young has published a number of articles on a variety of educationally related topics and has presented at several conferences on technology integration, professional development and leading professionals through the change process. Dr. Young believes deeply in the potential and promise of all students and the vitally important role school districts play in creating safe, welcoming, dynamic and innovative learning environments to help all students reach their fullest potential. Superintendent Young is always accessible to parents and staff by appointment. His Chief Assistant can set up those appointments at the contact information below.